On 9 May 1927 His Royal Highness the Duke of York opened Australia’s first purpose-built federal parliament building, now known as Old Parliament House. There was no national capital city when the Australian federation was formed in 1901 so, for the first 26 years as a nation, the federal parliament met in the Victorian state parliament in Melbourne. However, provision had been made in the Constitution for a seat of Government of the Commonwealth, to be located within Commonwealth territory in the state of New South Wales but not less than 100 miles from Sydney. The site for the national capital was finally announced in 1911, and an inauguration ceremony held on Capital Hill on 20 February 1913. In the accompanying audio from our oral history collection, Therese O’Neill recalls the long trip into Canberra from Yass as a 10 year old, and the thrill of being amongst the crowd gathered to glimpse the Duke and Duchess of York on the steps of the Provisional Parliament House at the opening. 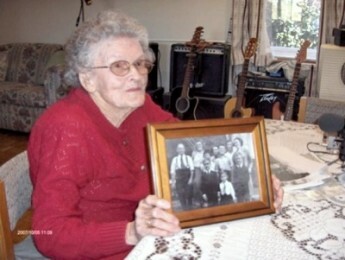 Mrs O’Neill was 90 years old when interviewed for our Oral History Program in 2007. The opening ceremony was simple but dignified, watched by a small crowd with a radio broadcast to stations in Queensland, NSW, Victoria and SA reaching over one million people. The Duke and Duchess of York (later to become King George VI and Queen Elizabeth) were greeted with a fanfare of bugles by eight Royal Marines - who had accompanied the Royal Party in the HMS Renown - and a 21-gun salute. The Duke reviewed the Guard of Honour and 4 year old Gwen Pinner presented a bouquet to Her Royal Highness. At the age of 67 years, Dame Nellie Melba sang the National Anthem. The crowd and the Canberra Philharmonic Society joined in a spirited repeat of the first verse. The Museum of Australian Democracy at Old Parliament House maintains an active oral history program, including interviews with former federal parliamentarians, people associated with former prime ministers, former workers and staff of Old Parliament House when it was home to federal parliament (1927 to 1988), and activists involved in political parties. This collection of interviews is an important archive of memories, providing a window into the history of federal parliament and its role in Australian democracy.